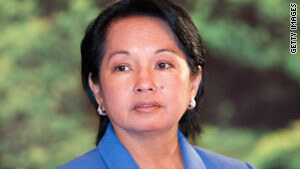 Philippine President Gloria Macapagal-Arroyo lifted martial law order imposed on December 4. (CNN) -- Philippine President Gloria Macapagal-Arroyo lifted martial law in the country's south, which she declared after the massacre of 57 people last month, Philippine news outlets reported Saturday. The order lifting martial law was due to be effective at 9 p.m. (8 a.m. ET) Saturday, the Philippines News Agency (PNA) and CNN affiliate ABS-CBN said. Military troops will remain in Maguindanao province to keep the peace despite the move, said Victor Ibrado, chief of staff of the Philippine armed forces, PNA said. Arroyo imposed martial law December 4 but lifted it Saturday after deciding it had achieved its objectives, Executive Secretary Eduardo Ermita said, according to PNA. Local government was now back in power and the justice system was functioning again, he said. Authorities have said the November 23 massacre in Maguindanao province was a politically motivated attempt to keep an opponent of the politically powerful Ampatuan family from running for governor. Thirty journalists were among those killed. The martial law allowed arrests without warrants, and at least six members of the Ampatuan family -- including a local mayor -- were arrested, according to ABS-CBN. Authorities raided a warehouse and ranch belonging to the family last weekend and confiscated firearms, ammunition and vehicles, Maj. Randolph Cabangbang, deputy of operations for the eastern Mindanao command, told CNN. Ermita said Saturday that three charges of multiple murders were filed in court, and that 24 people were charged with rebellion. The Philippine National Police has referred nearly 900 other cases to the Department of Justice, he said. Violence in the run-up to elections is not uncommon in the Philippines. The Maguindanao massacre, however, is the worst politically motivated violence in recent Philippine history, according to state media.